And it reminds me of a teddy bear…so cuddly! So that’s why his name is Teddy. I love how all the different blues and browns mesh together to give the whole set so much character and dimension. The different prints will mesmerize my customer’s baby for hours! This set also included a pale blue minky crib sheet and a box pleat crib skirt. 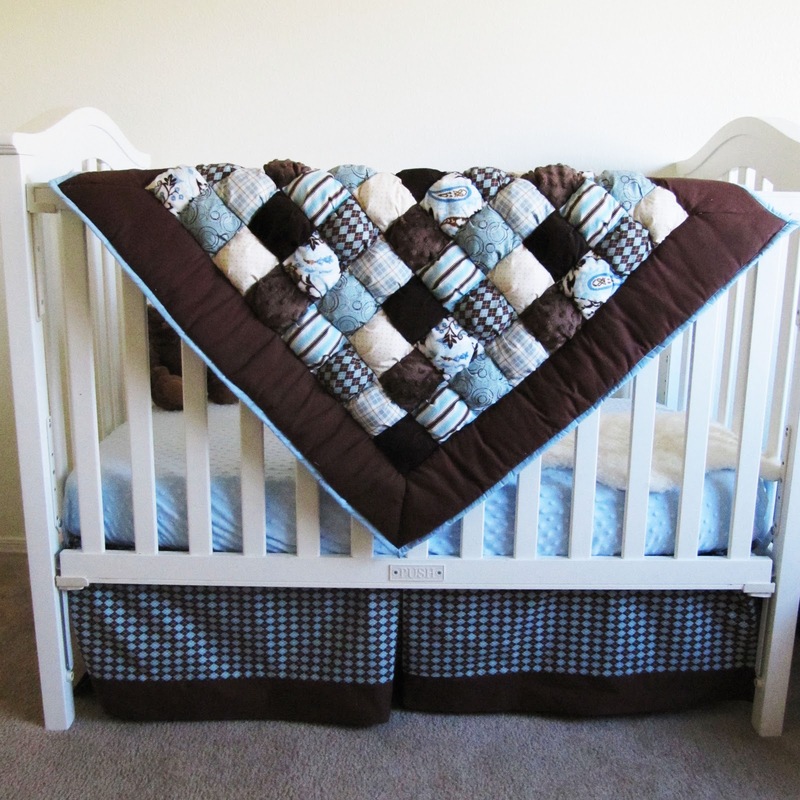 This set will be perfect for her little boy’s room. What do you think? Gorgeous! It looks so warm and snuggly!! It's absolutely beautiful!!! Where do you get your fabric? It's adorable! I love the prints! Beautiful! The colors are perfect together! The argyle is so fun! 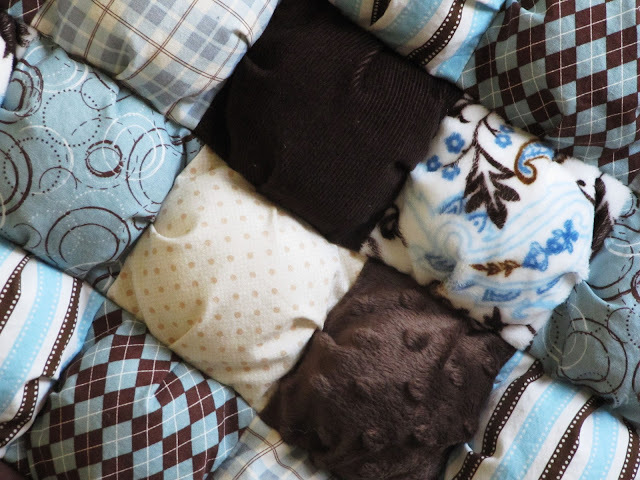 I'm just getting to the binding part of my first puff quilt.. did you use minky on the binding on this? Love this! Looks so comfy. I think I need one of these for me! Ha! Wow! Beautiful! that's one lucky baby!! Oh my, this is beautiful and the EXACT color scheme of my Baby W's room! Hi Jamie! Thanks so much. Unfortunately I’m not offering this set anymore as it was limited edition. hi! 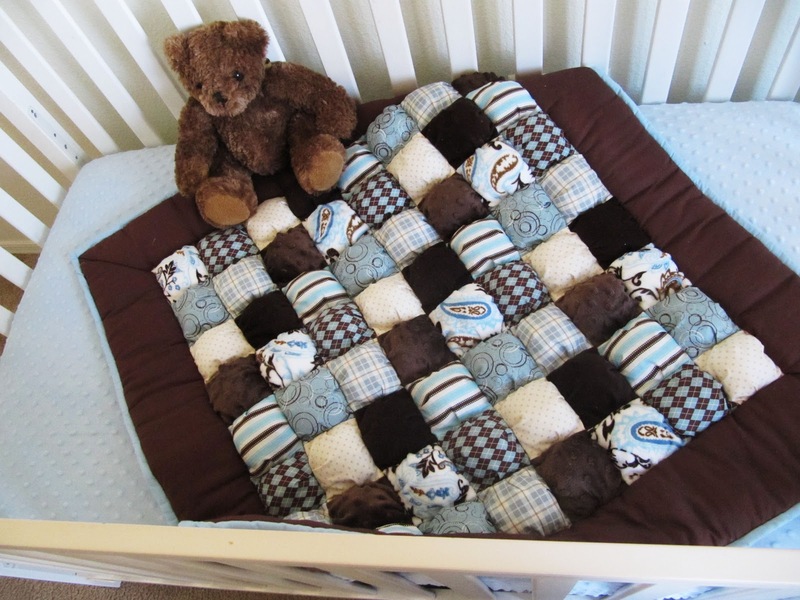 the teddy bear brown and blue quilt is so adorable. do you have any for sale? please let me know. Hi Angela. Unfortunately this item is sold out. Thank you though! where did you buy the splash bubbles fabric? Love this, is it available for sale?